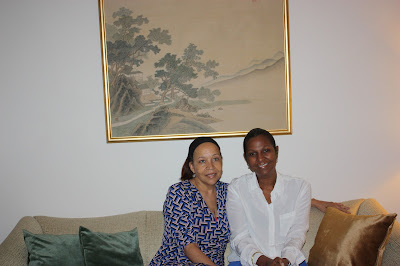 On my trip to Taiwan, Republic of China, I had never dreamed that I would be meeting the First Lady of Belize. We are friends via Facebook but had never met face to face. I arrived two days previously and was surprised to get an e-vite to visit with Mrs. Barrow who also happened to be in Taiwan on humanitarian work. Arriving at her hotel, the first thing that jumped out at me was her dynamic personality and her vivacious spirit…stronger than ever, with her hair pulled back in a bun, she was the epitome of gracefulness. Kim Simplis Barrow recently returned from a trip to the UK and Nigeria as part of her humanitarian work for women and children of Belize. In the UK, she created ties between London Children’s Hospital and she also hosted a very successful fund raiser for the new pediatric wing at the Karl Heusner Memorial Hospital in Belize City. Mrs. Barrow, Belize’s Special Envoy for Women and Children was in Taiwan on a working visit to learn more about the cooperation between Taiwan and Belize on humanitarian aid. Talking to Mrs. Barrow led me to believe that she takes her duties as Special Envoy very seriously and I can tell you that she cares deeply for the disadvantaged, the disabled, and the children and women of Belize. The purpose of the First Lady’s visit is aimed at gathering knowledge about the development of charity groups and non-governmental organizations in Taiwan and exploring future cooperation between Taiwan and Belize. I posed to her these two specific questions and got her reply. Linda Crawford: The Tzu Chai organization is set up to help the poor; is your humanitarian trip designed to build a stronger Belize-Taiwan relationship? First Lady Kim: This visit to Taiwan was designed to build relations with Belize particularly in the health sector as we seek to create partnerships for cooperation and support for the new Paediatric Intensive Care Unit being constructed at the Karl Heushner Memorial Hospital. Visits to the National Taiwan University Children's Hospital and the Far Eastern Memorial Hospital were enlightening as they relate to the design and function of the PICU as well as the possible establishment of a Dialysis Center in Belize City. For the Inspiration Center, visits to the Wenshan School of Special Education, the Genesis Social Welfare Foundation and the Children Are Us Foundation revealed significant ideas and opportunities to ensure the long term sustainability of the facility and to develop additional services for persons with disabilities in Belize. L.C. : What do you think the average Belizean could learn from an organization like this? First Lady Kim: What Belizeans can learn from the NGOs in Taiwan is the importance of looking after the vulnerable groups in our population. In the Chinese culture it is said that when you have extra, you should give to the less fortunate; if you cannot give financially, you can give of your time. All the organizations that I visited had many volunteer workers--some more than they need. That has been a great part of the success and sustainability of these NGOs that do so much for persons with disabilities, struggling single mothers, the poor, the homeless and other vulnerable populations that may have a harder time helping themselves. Many of you already know that Mrs. Barrow has been through some very challenging times in regards to her health and I must say how amazing it is to see how she has handled her situation. She looks wonderful and remains active. I think that keeping a strict diet, and being active seem to be just some of the ways to win the fight against cancer. And of course, being in good hands with her doctors at MD Anderson in Houston, Texas. A year and eight months after her diagnosis, Kim is taking it one day at a time, knowing that she's still in treatment, with no guarantees on life. Mrs. Barrow said that she is here with us today feeling pretty good and doing the work that she loves and has set out to do. It has been an amazing two weeks in Taiwan and I’m glad I got to meet this strong and brave representative for Belize, Mrs. Kim Simplis Barrow. Her work for women and children in Belize has been an inspiration to all of us. Fantastic job, Linda. I'm glad you got to meet her. Our first lady is very elegant in appearance and very humble in personality. She is a blessing to Belize. Keep up the impressive work Ms Linda! I like the emphasis on volunteer work. Many people want to help, they just need an opportunity. Also, encouraging volunteer work is beneficial to one's society as it promotes kindness to others and also often opens the door to work opportunities. Through volunteer work young people are often exposed to the realization that they would enjoy working certain jobs. Don't know what to say...Beside.... "2 wonderful ladies met"
Thank you, everyone. And Lily, I hope to be in D.C. before the end of the year. Maybe we can hook up then. I will give you heads up before I get there.